The financial markets have recently undergone a correction and subsequently entered a consolidation phase. When this happens all the investors re-evaluate their positions in the equities and try to re-balance their portfolio in favor of better stocks. As the indexes jumped back into their trend channels, there are two different types of stock price movements recognized in regards of individual stocks: those that bounced back with the market or did not even decrease much and those that stayed down. The second case is a risky choice to trade at the moment. The first case is the one where we can follow the trend and thus, I chose two well-positioned stocks in Financials sector: Jones Lang LaSalle and EZCORP. Jones Lang LaSalle Inc. is a rife real estate services company with a well-diversified portfolio. Its business model is mainly focused on Leasing, Property & Facility Management and Capital Markets. The company demonstrates healthy fundamentals. Return on Equity (RoE) is 8.41, Return on Invested Capital (RoIC) is 6.38 and Debt to Enterprise Value is 0.10. Furthermore, Jones Lang LaSalle has been beating the earnings estimates in 2017 and this trend is expected to continue. The technical analysis shows a strong bull trend as depicted below by blue parallel lines. Jones Lang LaSalle stock price recently bounced from 100 MA and now it snails right under its short-term resistance (wide orange line). A pullback to any moving average or break through the orange resistance is considered as a good buying opportunity. There is long-term resistance around 177 that must be watched. If the trend changes at this level, it can also be considered as a target price. 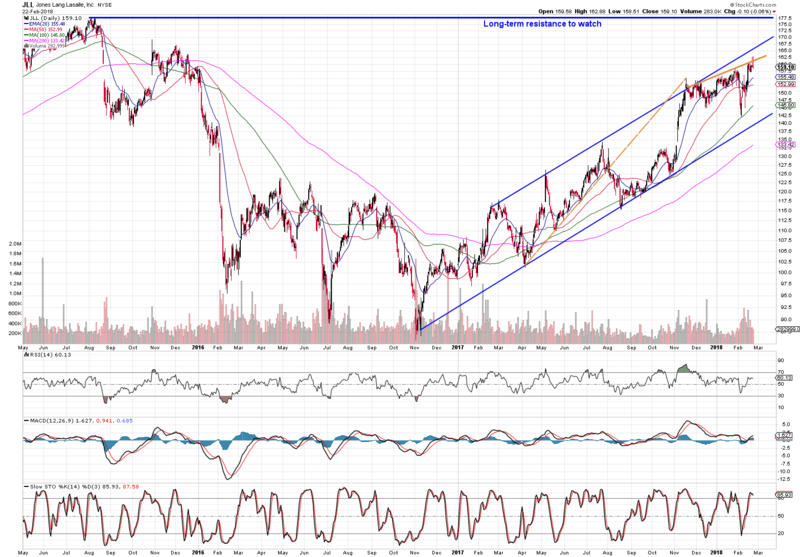 Once the long-term resistance is broken, Jones Lang LaSalle stock might be exposed to significant price rise. Ezcorp, Inc. is one of the biggest pawn shop chains in the United States. The company mostly receives a collateral in form of jewelry. Thus, the profits are positively correlated with the price of gold. Higher gold prices mean higher revenue for sold collaterals or higher interest rates from the face value of the collateral. Therefore, the earnings are higher when gold prices are higher. These days, gold is trading rather an upward direction since it bottomed at around 1050 USD/oz. in December 2015. At the moment gold is consolidating 30% up to around 1330 USD/oz. and trending higher. The fundamental ratios also demonstrate a good financial profile. Return on Equity (RoE) is 5.36, Return on Invested Capital (RoIC) is 3.69 and Debt to Enterprise Value is 0.45. Ezcorp last reported earnings of $0.28 has beaten estimate of $0.18 by 55%. A chart below illustrates a perfect example of trend following strategy. Ezcorp stock price has built a bull trend channel (blue parallel lines) and broke over a year-long resistance level (blue dashed line). 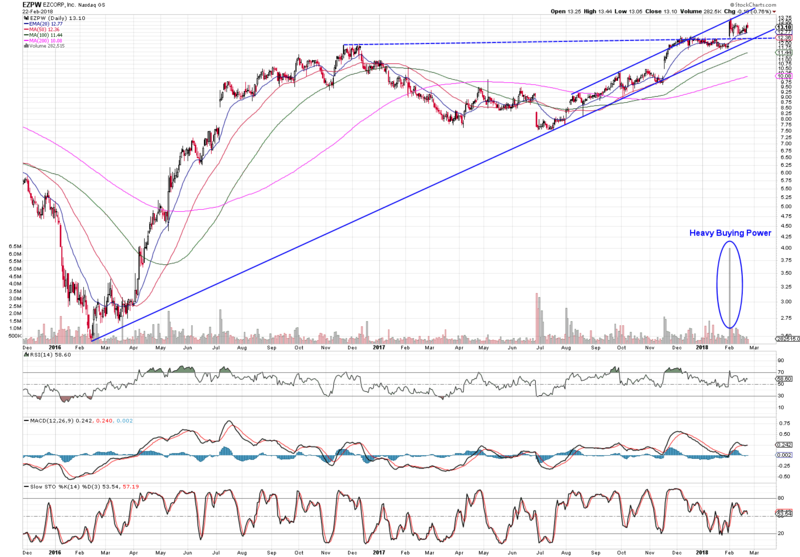 A strong bullish trend is confirmed by very high volume at the breakout on 1 February.